In her project My Very Own Porch on Ipanema Corner, LaTasha paid homage and gave voice to the neighborhood where she has lived since childhood – Harlem. Bringing her artistic sensibilities as a writer, vocalist, and sound artist to this work, LaTasha explored the social ecosystem of her bustling block corner, which is marked by the Ipanema Laundromat, through printed ephemera and video. Combining video documentary and oral history collection techniques, LaTasha created a platform for her longtime neighbors to share their varying perspectives on the changing face of Harlem. Her residency culminated with the beginnings of a video documentary about her neighborhood and a chapbook of collected prose from her neighbors’ musings about their community. Writer, vocalist, and sound artist, Latasha N. Nevada Diggs is the author of three chapbooks which include Ichi-Ban and Ni-Ban (MOH Press), Manuel is destroying my bathroom (Belladonna Press), and the album, Televisíon. Her work has been published in Rattapallax, Black Renaissance Noir, Nocturnes, Ploughshares, Black Belt (Studio Museum of Harlem), P.M.S, Jubilat, Everything But the Burden, Muck Works, and Mandorla, Fence to name a few. 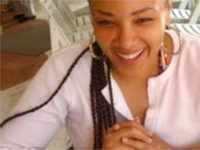 She has received several awards, residencies, and fellowships for her interdisciplinary work of them include Cave Canem, VCCA, Harvestworks Digital Media Arts Center, Rockefeller Brothers Foundation, New York Foundation for the Arts, The Eban Demarest Trust, Harlem Community Arts Fund, Barbara Deming Memorial Grant for Women, the Jerome Foundation, and Lower Manhattan Cultural Council. As an independent curator and director, LaTasha co-presented literary/musical events with The Black Rock Coalition Orchestra, at Lincoln Center Out of Doors and The Schomburg Center for Research in Black Culture. A native of Harlem, LaTasha is a 2011 Laundromat Project Create Change Public Artist in Resident and a Black Earth Institute fellow.